Successfully Added Clever Cube Advertising Host - Clever Canvas App, Android 5.1, 2GHz Amlogic CPU, Mali GPU, Android + iOS Support to your Shopping Cart. The Cleaver Cube advertising host is a diverse system that will change the way you engage your customers. With this innovative device you can manage TV screens and projectors with a custom display that can be easily updated and interacted with via your Android and iOS phone or tablet. Great for catching the eyes of passers by this powerful little box plugs directly into any HDMI screen or projector and with the clever canvas app installed you can create your own stunning digital signage in seconds. Perfect for anyone with a big screen they want to exploit for powerful targeted marketing. Simply draw or type your adds on a phone or tablet and send it direct to the Clever Cube controller wirelessly that will display it directly on the screen for all to see. With loads of templates, easy to use setup and plenty of cool features the preinstalled cleaver canvas app puts a powerful marketing tool in the palm of your hands. 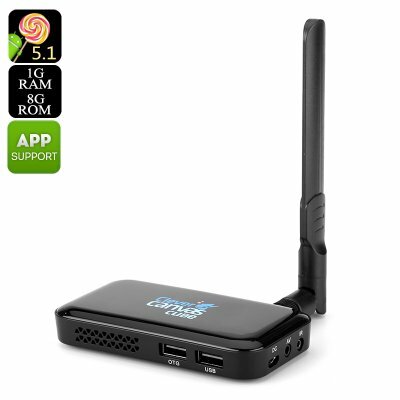 This advertising host runs on an Android 5.1 operating system and is powered by a Quad core Amlogic processer reaching speeds of 2Ghz and 1GB of RAM ensures it can easily handle high res images and video content. With 8GB of internal storage and a micro SD slot offering 32GB of expandable storage you have enough space for the most comprehensive marketing campaign tailored to you business. The Cleaver Cube advertising host is a superb way to unleash the your marketing potential and ideal for any cafe, bar, restaurant or store, it comes with a 12 months warranty and is brought to you by the leader in electronic devices as well as wholesale cool gadgets..